Link-a-Pix puzzles consist of a grid with clues scattered in various places. All clues, except the 1's, appear as same-number pairs. The object is to reveal a hidden picture by painting paths between same-number pairs where the length of the path (measured by the number of squares it passes through including the end-squares containing the clues) is equal to the value of the clues being connected. In other words, for every clue except 1 it is necessary to find another clue of the same value and join them together with a path of the corresponding length. The only exceptions are 1’s, which represent paths that are 1-square long. Paths may follow horizontal or vertical directions and are not allowed to cross other paths. The best way to learn how to solve B&W Link-a-Pix puzzles is to see a puzzle solved step by step from beginning to end. Solving B&W Link-a-Pix always starts with links of 1 since they don’t require pairing. Just find and paint (or draw a line across) all squares containing 1. Continue with links of 2, 3, and higher which clearly have a unique path. Note that longer links, such as the 4 and 5 on the bottom-left corner below, may have more than one path at this stage and must not be solved yet. Completed links may be painted after each step or left to the end after the whole puzzle has been solved. The next step is to link the two pairs of 5’s and the pair of 6’s which have unique paths as shown below. Sometimes Link-a-Pix puzzles contain more than two clues with the same value in the same area and it may not always be obvious which clue is paired with which. To get a clearer view, the red lines in the example below show the only way 8’s can be linked and approximately where the link of 9 should be located. As a result we see the link of 4 on the bottom-left corner must go downwards to make space for the links of 5 and 14 on its right. Looking carefully at the bottom-left area we see that the link of 14 must go to the right. Otherwise there won’t be enough space for all 14 squares under the link of 9. This means the link of 5, as well as the links of 8, 9 and 14 can be completed since there is no longer any ambiguity regarding their paths. The next step is linking the 8’s in the center, which have only one path possible. It is now clear the link of 5 must go towards the right, which leaves only one possibility for the link of 10 at the top. The puzzle is finished revealing the picture of a dog. Color Link-a-Pix puzzles are solved the same way as B&W with the additional rule that the color of the paths must be the same as the color of the clues being linked together. 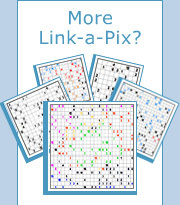 Solving Color Link-a-Pix always starts with links of 1 since they don’t require pairing. Just find and paint (or draw a line across) all squares containing 1 using the appropriate color. Continue with links of 2, 3, and higher which clearly have a unique path. Note that sometimes even short links, such as the 3 on the left edge of the grid below, may have more than one path at this stage and must not be solved yet. Completed links may be painted with the appropriate color after each step or left to the end after the whole puzzle has been solved. We can now link several longer pairs of 6, 7, 9 and 10 which we easily see have a unique path. The next step is linking the red 6’s, the red 10’s and the black 10’s. We can now also link the pair of 3’s on the left which we couldn’t solve in step 1. We now come across a more complex situation in the bottom area of the puzzle. The blue link of10 in the bottom area has more than one path. However, the first six squares on the left of this path are unique so we will draw them now. This kind of partial path technique is often essential for some puzzles. Similarly, we can draw the first three squares of the black link of 9 which will help us in the next step. We now see completing the partial blue link of 10 is easy. There is only one way the path can go after drawing the partial path from the black 9. In this step we can also link the pairs of 3 and 5 in the center. Finishing the puzzle is now straight forward by linking the remaining red pairs of 4, 8 and 9, and the two black pairs of 9. The puzzle is finished revealing the picture of an exotic island at sunset.